Sunday worship in Broadmead Baptist Church Woodford? 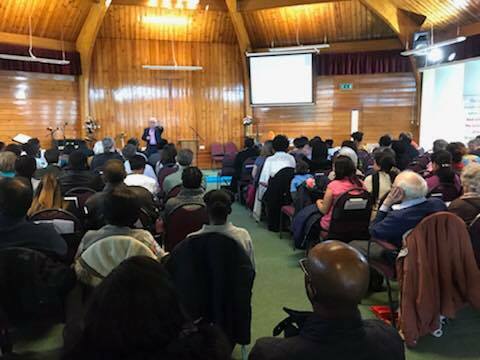 Sunday worship begins with a warm welcome, great worship, an impacting preach from a passage in the Bible and a friendly bunch of people gathering to learn more about God. Children usually stay with their parents at the start of the service as we worship (sing songs!) together for the first part of the service. Though we have a creche area with a window into the service and someone who can stay with you should this be your desire. You will also be able to hear everything that’s going on through the connected speaker. After about half an hour, the children usually leave for Sunday Club which lasts around half an hour. Everyone then returns for tea, coffee and biscuits served after the service! There is no dress code. Just wear something comfortable. Whilst we pass around an offering bag, please don’t feel embarrassed to allow it to pass by. We are an independently financed church, receiving no denominational money but we are supported by the regular giving of our members and regular attenders. You wil find us next to the Esso Garage on Chigwell Rd and we have plenty of free car parking behind our church.